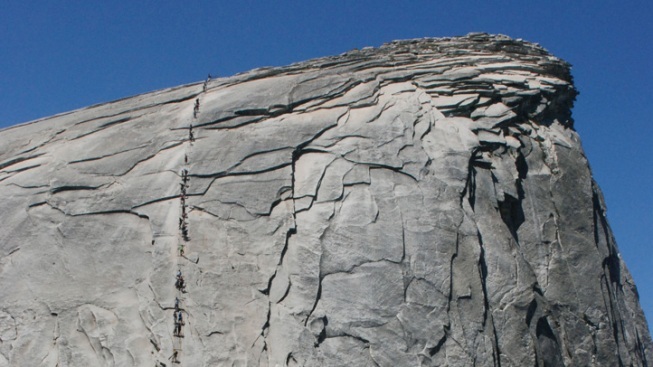 In this July 23, 2011 photo provided by the National Park Service, visitors are seen climbing Half Dome via cables in Yosemite National Park, Calif. The hike up the granite monolith Half Dome in Yosemite National Park is one of the most iconic in the nationwide system, but on Friday officials announced approval of a plan that permanently limits how many can do it. National Park Service authorities will issue permits to limit the number of hikers to 300 a day, the target number since an interim plan was approved in 2010 to reduce congestion in a wilderness area and make the hike safer. In a blow to environmental groups, the park also decided to keep in place the heavy metal cables drilled into the monolith that hikers use to steady themselves on the 45-degree final climb up slick granite. Some groups had argued that handrails do not belong in a federally designated wilderness area. "With a place like Yosemite that is so dear and important to millions of people, everyone has ideas about what wilderness protection is. We tried to find a balance that allows people to still experience Yosemite while protecting Yosemite,'' said spokeswoman Kari Cobb. Over the past decade the route had been inundated with up to 1,200 nature lovers a day seeking to experience the iconic mountain that is stamped on the California quarter, stitched on a line of outdoor clothing and painted on the side of the park's vehicles. Congestion on the dome made it difficult for hikers to descend when inclement weather struck, as it often does on summer afternoons. At least five people have died on the cables since 2006, nearly all with rain as a factor. Park officials want visitors to be able to descend the slick granite in 45 minutes if they have to escape the fast-forming storms, and limiting numbers is the only way to do that, they say. As calls for rescues increased, park officials began looking for solutions in 2008. Two years later an interim plan was introduced to allow 400 hikers a day to get permits through a lottery system that takes place in March. Authorities have tweaked the system since then to account for no-shows and to allow a secondary lottery two days in advance for those who travel more spontaneously. "It was a really good tool that we used to provide no-show and cancellation permits to people who made last-minute plans,'' Cobb said. In 1874 the slick dome that rises 5,000 feet above the valley floor was described as "perfectly inaccessible.'' But in 1919 the Sierra Club installed the first cables along the 400-foot final ascent so that visitors without rock climbing experience could hoist themselves to the summit the size of 17 football fields to drink views of Little Yosemite Valley, El Capitan, endless Sierra and the Valley floor. There is no doubt that if the decision were made today, there would be no braided steel cables and stanchions drilled into Half Dome. Congress passed the Wilderness Act in 1964, and 20 years later designated 95 percent of Yosemite, including Half Dome, as land that should not be altered by man. The eight-mile round trip hike is the busiest by far of any in the National Park's designated wilderness areas. Over the decades the number of visitors to the park has steadily climbed, topping 4 million in part because the park is an easy drive from Los Angeles and the Bay Area. Now scaling Half Dome is a measure of personal fortitude for some who had worried that without cables access would be lost.